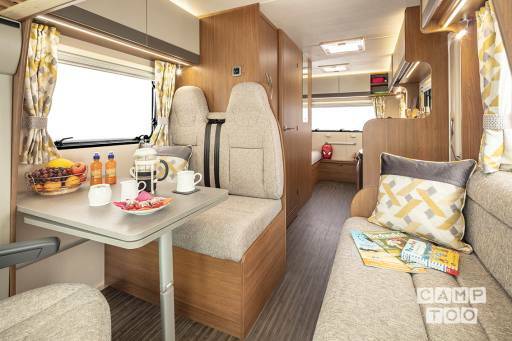 In this Hi-Line configuration, the Auto-Trail Tribute 720 can sleep up to six, with belted travel seats for four, making the 720 model an ideal family motorhome. There is also a spacious washroom with separate shower, designed with your comfort in mind. Give children their own space to play, or let them sleep in the rear convertible lounge area whilst you enjoy some quiet at the front. The choice is yours with the Auto-Trail Tribute 720 thanks to an ingenious flexible layout. The two zones are separated by the nearside kitchen and washroom and wardrobe opposite and both can be converted into double beds at night time. In Hi-Line configuration, the 720 can sleep up to six, with belted travel seats for four, making the 720 models ideal family motorhomes. As this motorhome is under 3500kg a standard B1 driving licence is required, so there are no restriction for anyone wanting to hire this motorhome. What’s Included with Our Motorhome Hire? WHO CAN DRIVE THE MOTORHOME? All drivers must be between the ages of 25 and 70. All drivers must have held a full licence for a minimum of 2 years, and have completed our Driver Information Form. Our rates include cover for one driver but at an additional cost an extra driver can be added. CAN I DRIVE IT ON A STANDARD CAR LICENCE? Contact us via telephone or fill in our contact form to confirm availability for the vehicle you require. On booking a deposit of £200 per week is required, the balance is due 28 days prior to the commencement of the hire or immediately if your hire date is within 28 days. WHAT DO I NEED TO BRING WITH ME ON THE DAY OF HIRE?